A low grade fever and body aches are common signs of influenza, or the flu. Headache and fatigue often accompany a fever and body aches, especially if one is suffering from the flu. The best way to avoid fever, body aches and other flu symptoms is to get the flu shot. This is especially true for children, the elderly, and anyone with a compromised immune system. A fever is typically a sign that the body is fighting infection. A fever is typically considered “low grade” if it is between 99.9 and 101 degrees Fahrenheit. However, fever in children and particularly infants should be watched carefully. A newborn with a temperature of 101 degrees Fahrenheit needs emergency medical attention. When you have a viral infection like the flu, your body diverts white blood cells to fight the infection. Those white blood cells are normally assigned to keep your joints and muscles in optimal working order. When they get called away, you develop body aches. Unfortunately, if you have the flu, you are probably contagious. Most adults become contagious a day before symptoms start and remain contagious for up to seven days. Children sometimes are contagious for longer periods. Take over-the-counter medicines such as acetaminophen or aspirin. 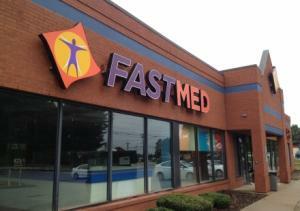 FastMed Urgent Care is available when you need us, and you don’t need to wait for an appointment. We have locations open 365 days a year, and our medical professionals can help diagnose and treat your low grade fever and body aches. Check out our Health Resources Center for more answers to your health questions. When you are ready to get relief for your flu-like symptoms, contact us or simply walk into your local FastMed Urgent Care.